For many animal advocates, keeping companion animals raises tricky ethical dilemmas. The widely accepted conviction that we have to feed our dogs and cats the flesh of other animals means compromising on our own morals, buying into the systems of broader animal exploitation and suffering that we reject when it comes to our own diets. Author Julian Baggini points out that all too often “the only animal welfare that seems to count when buying pet foods is that of the beast being fed”. In the United States about 300 manufacturers produce more than 7 million tons of pet food each year, a large percentage of which is meat (mixed with cereals, grain, vitamins, and minerals). With 85 million American households feeding one or more companion animal, it’s less shocking than it sounds that pets consume thirty percent of all animal-derived calories in the States. Americans spend about $30 billion a year feeding their fur babies, which means the pet-food industry plays a significant role in propping up factory farming. Unlike meat for human consumption, pet food rarely carries any assurance of higher livestock welfare. There’s also the environment impact to consider: pet foods are responsible for 25 to 30 percent of the environmental impact of meat in America, pet food production generating about 64 million tons of greenhouse gases each year and contributing towards the 550+ dead zones around the world, vast areas of ocean in which life has been destroyed by agricultural waste. Every meal we feed our pets has potentially devasting consequences for wildlife as well as domestic farmed animals: aquatic and land-based. We see a similar discrepancy between the care we give our companion animals and that we give other domesticated creatures in our society in the testing of pet food. Cruel vivisection practices in the industry were exposed in 2003 undercover footage from a testing facility contracted by Iams, where many invasive tests resulted in the death of laboratory animals. Unfortunately this harmful animal testing isn’t unusual. In October last year a Foundation for Biomedical Research campaign called Love Animals? Support Animal Research celebrated “how medical discoveries made with animal research have helped our companion animals live longer, happier, healthier lives.” Why is it acceptable to conduct dangerous experiments on one kind of animal to benefit another, even when both these animals might be, for instance, beagles? Indeed, when it comes to testing on so-called ‘lower order’ animals like rodents, the suffering experienced by laboratory animals may well exceed any resulting reduction of suffering in our dogs and cats. Perhaps we should be making greater demands of pet food manufacturers, insisting that the food we feed our loved companions has not been produced at the expense and pain of other, less-privileged animals. Is meat really a ‘good’ ingredient? Of course, it’s all very well to rationally know that our choices on behalf of our pets cause suffering, but contrary to utilitarian ethics, most people are highly motivated to privilege the needs of their own nearest and dearest even at the cost of letting dozens of other animals perish. But what if our current choices aren’t actually the best for our pets? Most dog food isn’t made of the juiciest cuts of meat but of ‘by-product’, a euphemism for the cast-off animal body parts that slaughterhouses can’t or won’t sell to humans. Most pet owners I know would put their own lives at risk to protect their companions, so why are we compromising like this on their diets? Baggini considers that as human demand for higher welfare meat grows, the by-products of that meat available to pets will be higher welfare too. But until then, the impetus is on us to demand the best, ethically and nutritionally, for us and for our pets – and perhaps that’s a diet that omits meat altogether. With a balanced, nutritional meal plan, the evidence suggests that dogs can thrive without meat in their diets. While we’re still in the early days of commercial testing, many veterinarians strongly advocate that canines can do very well on vegetarian or vegan diets. A 16-week study of 12 sprint-racing Siberian huskies had some of the dogs fed a commercial diet recommended for active dogs, and others a meat-free diet formulated to the same nutrient specifications. Regular veterinary checks and blood tests were performed, and showed that all dogs remained in excellent physical condition with normal blood results throughout. Indeed, small animal nutritionist Cailin Heinze states that “it’s much more common for dogs to have allergies to meat than to grain” with chicken, beef, eggs, dairy and wheat causing the most common allergies in canines. But of course, we must be mindful of our own dog’s specific, individual needs. In a recent interview with the New York Times, Lisa M. Freeman, a board-certified veterinary nutritionist, concluded “We want them to be eating a diet that is nutritionally balanced. That means it has all the proteins, vitamins and minerals that they need in the correct ratios and with the best quality control. It isn’t easy to formulate a high-quality diet for dogs, and it’s particularly difficult with a vegan diet.” Still, with more and more reputable vegetarian and vegan dog food brands springing up every day, the challenge of formulating this balanced diet is being taken out of our hands. It’s becoming increasingly easy to make a transition that could have multiple benefits, from reducing pet obesity to knowing one is making the most ethical choice for planet, farmed animal and pet. So why do we continue to feed our dogs meat, when our personal ethics say no? Unfortunately, the assumption that our dogs are natural carnivores prevails and is used as a key marketing messages for raw pet food companies pushing grain-free or ‘all-meat’ products (proposed as ideal for animals that descended from wolves). It’s widely accepted that because nowadays humans no longer have to eat meat, we can make rational decisions based on morality rather than necessity. We can decide that we'd rather choose a tasty soy-based meat alternative, or an oat milk, or use flaxseed instead of egg in a cake, and know that this decision is benefiting the environment, other animals, and our own health. But what about our companion animals? Well, our dogs are really no closer to wolves than we are to our cavemen ancestors. Evidence suggests that we domesticated these animals as long as 33,000 years ago, when we were very much still hunter-gatherers. To equate the needs and desires of today’s pet dogs with those of wild creatures seems slightly crazy. 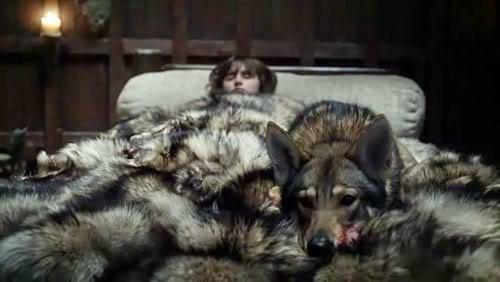 Bran Stark and his ‘direwolf’ Summer, in Game of Thrones. The direwolves in the TV show are actually Northern Inuit dogs: the breed is extremely friendly, not aggressive and will submit if challenged. Our dogs have evolved to digest the starch in plant-based or omnivorous meals, and have no need to hunt and kill their own food: the responsibility has shifted to us, their human companions, to provide them with healthy, balanced meals. If those meals can not only be nutritionally fulfilling and tasty but also benefit the planet and other creatures, why should they have to contain meat or animal products? Removing animal flesh from pet food would have an enormously beneficial impact on the environment and the suffering of the 3 billion sentient land animals farmed to meet demand of America’s 180 million dogs and cats. Ari Benjamin has previously written about the problems with keeping outdoor cats, the single greatest source of human-caused wild mammal and bird deaths in the U.S. Cats were domesticated far more recently, and as any reluctant recipient of their pet’s proud ‘catch of the day’ will know, the feline instinct to hunt and kill is very much alive and kicking. Moreover, domestic cats are obligate carnivores; they lack the genetic, biochemical and behavioural adaptations that enable dogs to thrive on an omnivorous diet. They take 52% of metabolizable energy from protein, similar to the diet of wild cats, meaning that they cannot obtain all the nutrients that they need from plants and bacteria. While research shows that cats can survive on a vegan diet, they require extremely careful monitoring and nutritional substitutes (vegan diets can result in more alkaline urine, for instance, which can cause urinary stones and serious blockages in male cats). In reality, very few owners have the time or confidence to undertake this challenge. One option is to choose meat from larger farmed animals so that there is less suffering per can. And more exciting changes are just around the corner: the advent of ‘clean’ or cultured meat, grown from animal cells harvested without harming the donor, could see cat food that contains the required meat proteins without the cruelty. Wild Earth Pets are doing pioneering work in this area, as well as creating dog food from cultured Koji fungi. While our dogs and cats might not lie awake at night worrying about climate change and the fate of billions of factory-farmed animals, nor are they responsible for purchasing the food that funds these problems. That burden lies with us, their owners, and, happily, it’s never been easier to buy out of unethical pet food production. With a little research and some thoughtful choices, we should all be able to sleep more soundly knowing that not only are our pets healthier, but the world is no worse off because of us.